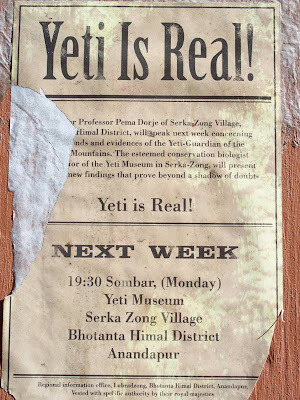 Main Street Gazette: Yeti Is Real! I found this little notice posted on the walls surrounding the Yak and Yeti restaurant construction. Apparently refurb walls aren’t just for “pardoning our pixie dust anymore,” just ask those ornate gates that were added to The Haunted Mansion during its recent closure. It’s a shame that, generally, Animal Kingdom isn’t open late enough, for those of us who might be interested, to venture back into Serka Zong for this lecture. Ah well, maybe the video will appear on You Tube.